1. Altered target site. A fungicide has a specific target site where it acts to disrupt a particular biochemical process or function. If this target site is somewhat altered, the fungicide no longer binds to the site of action and is unable to exert its toxic effect. This is the most common mechanism that fungi use to become resistant. See example below. (i) Enzyme A is necessary for carbohydrate metabolism in fungi. The target site is the point where the enzyme is used. 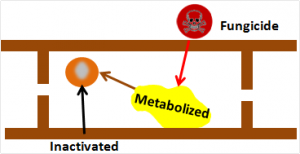 (ii) Fungicide A interferes with carbohydrate metabolism by filling the target site of Enzyme A. (iii) In resistant fungi, a part of the site is altered preventing the fungicide from fitting, but allowing carbohydrate metabolism to occur. Detoxification or metabolism. 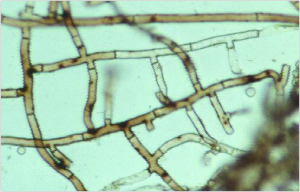 Metabolism within the fungal cell is one mechanism a disease pathogen uses to detoxify a foreign compound such as a fungicide. A fungus with the ability to quickly degrade a fungicide can potentially inactivate it before it can reach its site of action. Removal. A fungal cell may rapidly export the fungicide before it can reach the target site of action. 4. Reduced uptake of fungicide. The resistant pathogen simply absorbs the fungicide much more slowly than the susceptible type. Is Resistance to Blame? — Most fungicide failures are not likely due to resistance. 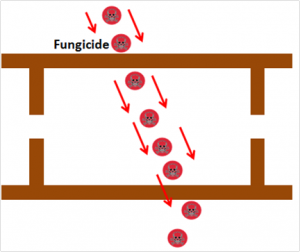 Mechanisms of Fungicide Resistance — There are several ways that populations of fungi become resistant. Proactive Fungicide Resistance Avoidance — Use diverse disease control tactics to help avoid resistance. 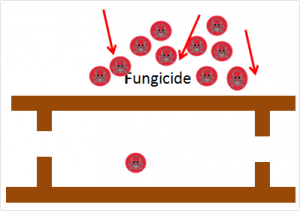 Spraying by the Numbers — Fungicides with similar modes of action could exhibit cross resistance. One way to avoid this is by rotating chemically dissimilar fungicides.